Last time I went on a household cleaning spree, I decided to clean out our family medicine cabinets. I found a lot of items left behind from previous house guests, items that my family doesn't use - but I didn't want to toss them in the trash. I started considering creative ways that I could use them. 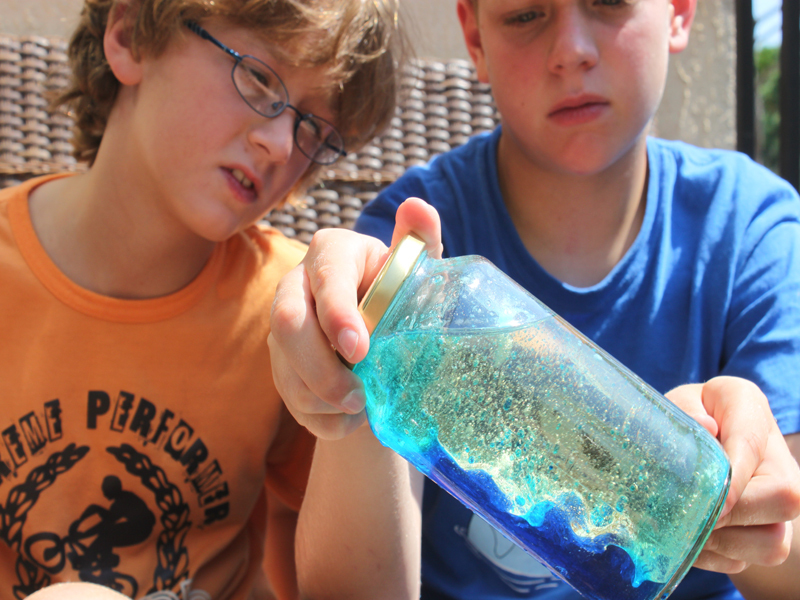 When I came across a package of Alka-Seltzer, I figured that since it fizzes and bubbles when added to water, I could use them to make lava lamps with the boys. 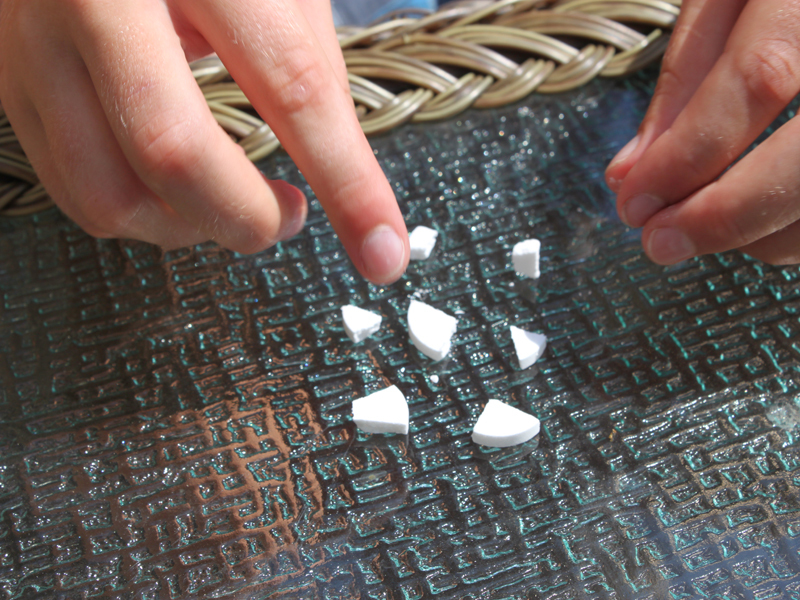 We headed outside with the Alka-Seltzer tablets and a few other items from our kitchen cabinet and <a href="http://www.inhabitots.com/how-to-set-up-a-home-recycling-center-with-your-kids/">recycling bin</a>. What ensued was an afternoon packed with learning fun as my boys created lava lamps using these ingredients. 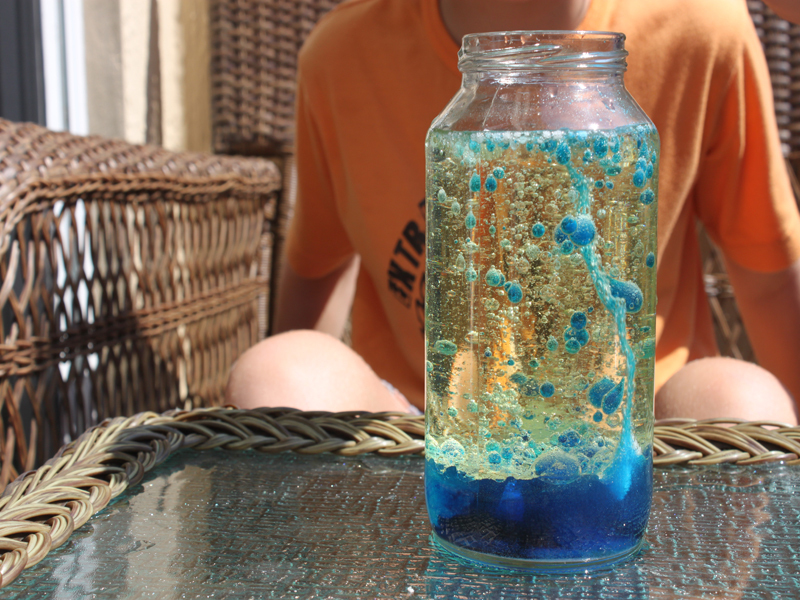 Read on to learn how you can and your kids can create this <a href="http://www.inhabitots.com/science-project-for-toddlers-teaches-them-about-color/">science experiment</a> too. 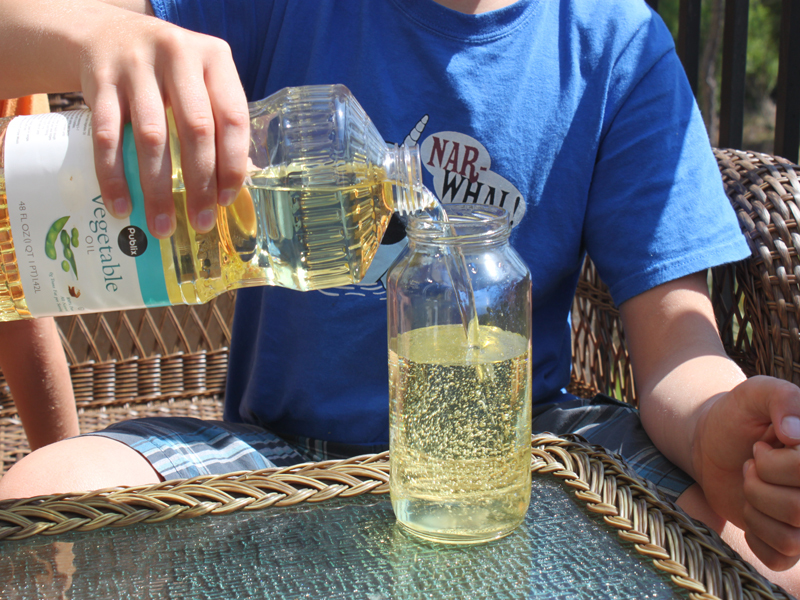 <h2>Step 1: Add the Oil</h2> Have your child fill an empty container 3/4 full of cooking oil. 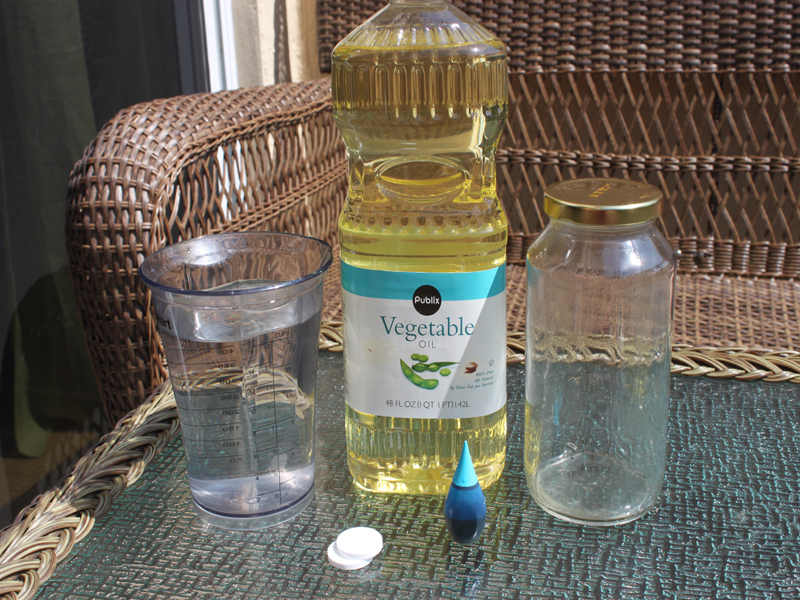 <h2>Step 2: Add the Water</h2> Then, fill the rest of the bottle with water, leaving about an inch of bottle empty. 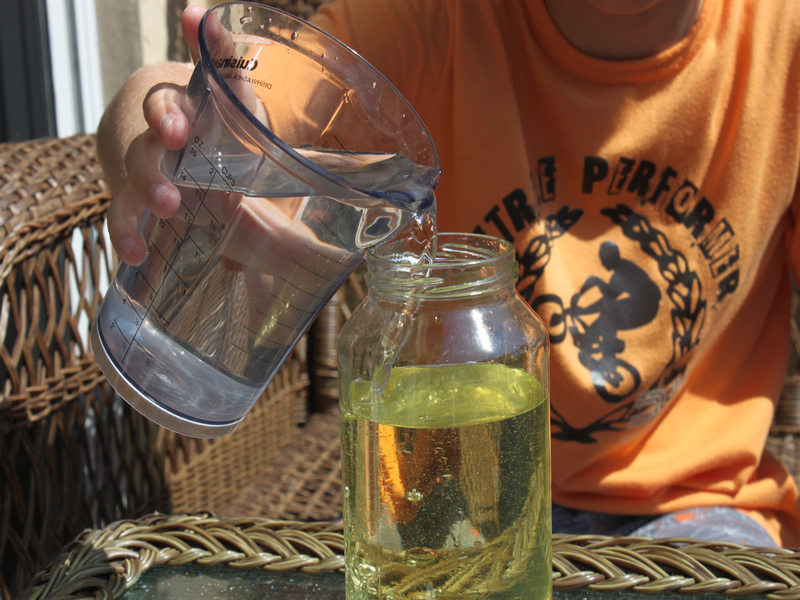 <h2>Step 3: Add a Little Color</h2> Let your child drop 10 droplets of food coloring into the bottle. <h2>Step 4: Add the Bubbles</h2> Break an Alka-Seltzer into about 8 small pieces and drop them into the bottle. <h2>Step 5: Watch!</h2> When the Alka-Seltzer hits the water it will start to fizz causing the colors to erupt! After your child has added all of the Alka-Seltzer to the lava lamp, screw the lid on and turn the bottle upside down and watch a lava blob appear. <h2>Why It Works?</h2> Oil and water do not mix, the food coloring will only mix with the water and the Alka-Seltzer tablets react with the water causing tiny bubbles. The bubbles attach to the little blobs of color causing them to float. Then, when the bubble pops, the blob sinks back to the bottom. Last time I went on a household cleaning spree, I decided to clean out our family medicine cabinets. I found a lot of items left behind from previous house guests, items that my family doesn't use - but I didn't want to toss them in the trash. I started considering creative ways that I could use them. 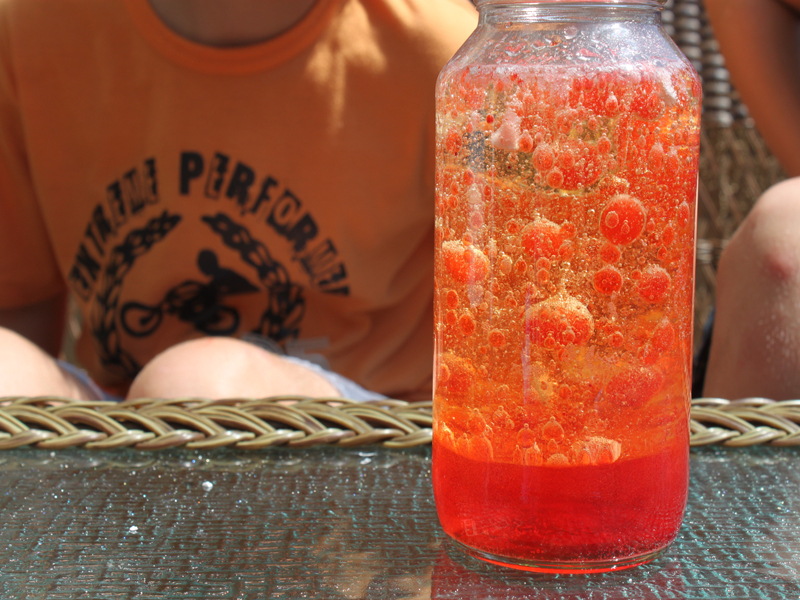 When I came across a package of Alka-Seltzer, I figured that since it fizzes and bubbles when added to water, I could use them to make lava lamps with the boys. We headed outside with the Alka-Seltzer tablets and a few other items from our kitchen cabinet and recycling bin. What ensued was an afternoon packed with learning fun as my boys created lava lamps using these ingredients. 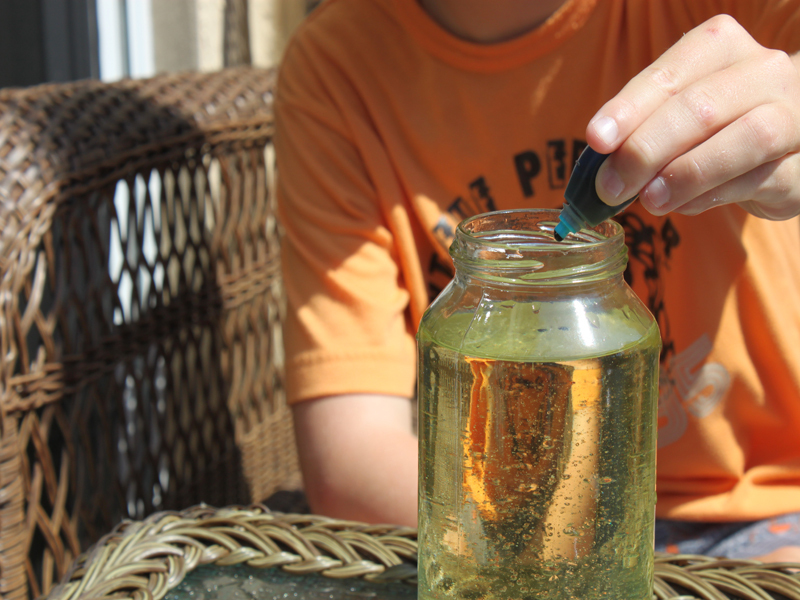 Read on to learn how you can and your kids can create this science experiment too.